The author used the anecdote to illustrate his point that, if the blessed in Heaven are willing to do so much for one Hail Mary, what more would they do for one Communion? And I got that, but what really stuck with me was the "one Hail Mary". One Hail Mary ... why don't I pray it more often? There's no reason to limit it to the confines of the Rosary or Angelus. It's such a short, simple prayer, and it's certainly a better thing to have in my head than the usual banal chatter careening about in there. And it's a beautiful way to tell our Blessed Mother how much I love her, which I really should do more often. 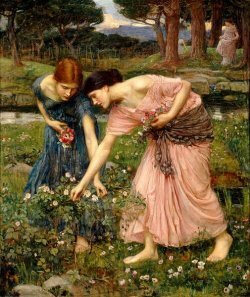 ... an endless garden in which there grew all the species and hybrids of roses in existence, whose perfume filled the air. The grass was bright green, the sky was deep blue, and trees of every kind dotted the landscape, as did pools and lakes and flowing rivers of varying sizes. The sun shone brightly, but didn't scorch or blind. Birds called from the trees and water and sky, fish flashed through the streams, and animals played peaceably among the roses. In the garden's center was a trellis whose size dwarfed the baldacchino in St. Peter's Basilica, with roses climbing, cascading, and sticking out all over. The trellis towered over a large, white marble dais, veined in gold, silver, and bronze. On the dais sat a polished, high-backed cedar bench whose entire surface was carved with roses, animals, birds, and fish. A plush, amethyst cushion covered the seat. The armrests on each side of the bench curved gently inward, giving it a crescent-shaped appearance. Sitting on the bench were Mary and Joseph -- he, with his right arm around her; she, resting her head on his shoulder. The young couple were dressed in royal splendor -- flowing, gold-embroidered robes and mantles. Mary's dress was ruby, her veil and mantle sapphire. Joseph's robe was emerald and his mantle jasper. The matching embroidery on their clothes was of the Sacred Heart, which was depicted in varying sizes. Both wore gold crowns with the Sacred Heart as points. Vases and bowls and containers of all shapes, colors, materials, and sizes covered the dais and surrounded the bench, and roses were arranged in all of them. Those roses represented all the Hail Marys I'd prayed throughout my life, but the containers were not full by any means. I imagined myself as I was as at age 9. I wore a simple, pink dress, and I stood barefoot before the Holy Spouses, holding a long-stemmed red rose. As I prayed a Hail Mary, I presented to Our Lady the rose, which she delightedly accepted. Joseph laughed with joy at her happiness. I prayed another Hail Mary and gave her another rose, which had appeared in my hands. With each Hail Mary, a new rose appeared for me to give, and the rose that Mary had been holding re-appeared in one of the vases and bowls and containers. As I now pray the Hail Mary, not only do I pray it for the usual reasons, but I seek also to fill the dais to overflowing with roses before I die. Not so much to increase my degree of glory or joy in heaven, but simply to make Mary and Joseph as happy as I can, while I can.